All consecutive patients undergoing PD between January 2014 and December 2015 at a single center were retrospectively analyzed. Since May 2015, all operated patients had the NGT removed immediately after the procedure (NGT− group) and were compared to patients operated before this practice (NGT+ group), who had the NGT maintained until at least postoperative day 3. During the study period, 139 patients underwent PD, of whom 40 (29%) were in the NGT− group and 99 (71%) were in the NGT+ group. 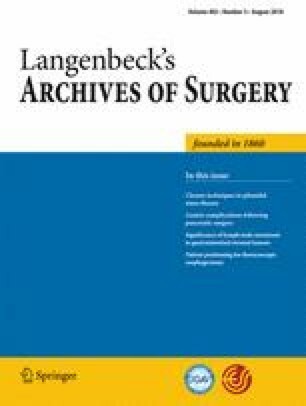 The length of hospital stay (LOS) and rate of postoperative complications of grade 2 or higher according to the Clavien-Dindo grading system were significantly higher in the NGT+ group [14 (11–25) vs. 10 (8–14.2), P = 0.005 and 82.8 vs. 40%, P < 0.001, respectively]. Incidence and severity of delayed gastric emptying (DGE) grade B–C were also higher in the NGT+ group (45.5 vs. 7.5%, P < 0.001). There was no difference between the two groups concerning the 90-day postoperative mortality (P = 0.18). The present work was presented as an oral communication at the 12th Annual Joint Congress of the French Society of Digestive Surgery (SFCD) and the Association of Hepato-Biliary Surgery and Transplantation (ACBHT) in December 2016, Paris, France.